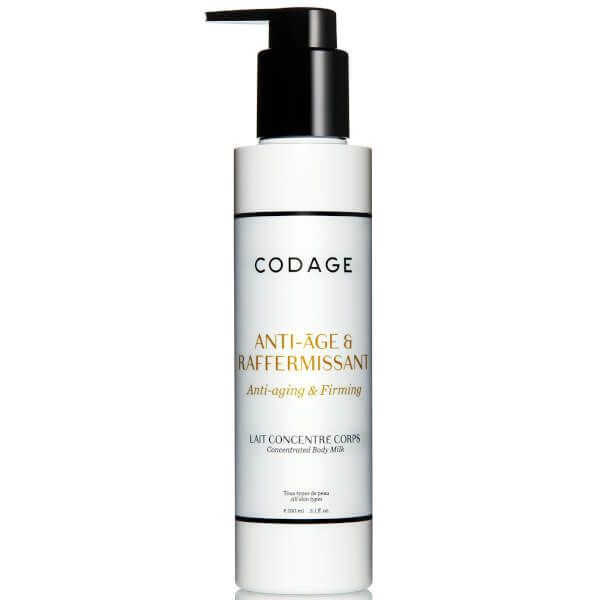 The CODAGE Anti-Age & Firming Concentrated Milk harnesses a unique, scientifically developed formulation to target premature signs of ageing and unveil youthful looking skin. Fortified with Hy3 and Hy+ moisturising technologies, the fluid, lightweight treatment contains a concentration of high molecular weight Hyaluronic Acid to optimise moisture levels and water retention abilities for deep, long lasting effects. A trio of peptide-rich agents – Ao3, Fe3 and Aa – deliver advanced anti-ageing actives to smooth the appearance of wrinkles, with Maritime Blue Thistle Stem Cells seeking to visibly improve firmness and elasticity levels. A host of naturally derived antioxidants neutralise free radical damage and combat environmental aggressors, while promoting enhanced repair and renewal. Suitable for all skin types, skin is left feeling noticeably firmer and replenished with superior moisture and a more even tone. Aqua (Water), Butyrospermum Parkii (Shea Butter), Linoleic Acid, Adansonia Digitata (Baobab) Seed Oil, Punica Granatum Seed Oil, Caprylic/Capric Triglyceride, Butylene Glycol, Propanediol, Erythritol, Lauroyl Lysine, Jojoba Esters, Sodium Hyaluronate, Eryngium Maritimum (Sea Holme) Extract, Centella Asiatica Extract, Acacia Decurrens Flower Wax, Spilanthes Acmella Flower Extract, Pisum Sativum (Pea) Extract, Acacia Senegal Gum, Biosaccharide Gum-1, Bacillus Ferment, Glycerin, Plankton Extract, Cetyl Alcohol, Helianthus Annuus (Sunflower) Seed Wax, Glyceryl Stearate, Darutoside, Linolenic Acid, Peg-75 Stearate, Homarine Hcl, Cyclodextrin, Ceteth-20, Propylene Glycol, Steareth-20, Xanthan Gum, Polyacrylate Crosspolymer-6, Caprylhydroxamic Acid, Sodium Levulinate, Polyglycerin-3, Sodium Anisate, Glyceryl Caprylate, 1,2-Hexanediol, Dimethylmethoxy Chromanol, Sodium Hydroxide, Potassium Sorbate, Sodium Benzoate, Sodium Gluconate, Parfum (Fragrance).